Body shame and dissatisfaction are a common concern in psychotherapy offices. Therapists are in a unique position to name and dispel myths regarding weight and body size with their clients. Unfortunately, many therapists do not feel adequately trained nor do they fully understand the impact of sizism on the lives of their clients. Those of us who have worked in the disordered eating and body dissatisfaction corner of the mental health world know something that we wish everyone knew: there is no weight loss prescription, weight change suggestion or diet that is psychologically benign. Clinically and culturally, we fail to name and acknowledge the impact of weight stigma on us all. People large and small are often hustling for weight and body change and have their worthiness bound up in the pursuit. All too often, weight change is mistakenly seen as a possible and helpful intervention for clients who live in larger bodies or who feel dissatisfied with the bodies they are in. The amount of weight bias in the literature (and therefore the medical community) is astounding. Health and mental health care providers must become critical reviewers of the research to provide safe and ethical services. Many studies finding a correlation between weight and health have not controlled for things like SES, weight cycling, fitness, stigma, oppression, trauma, and more. Correlation is different than causation. Conversations about inclusion and social justice do not commonly include sizism and fatphobia. It is commonplace to believe that a little shame and public humiliation can provide catalyst for change – something we all know to be false about the change process. The truth? Fat people have always existed and will continue to. This is not an abomination or culture gone wrong. But it is an intersection. Fat people are less likely to be believed, trusted, treated (medically) and hired. Add intersections of race, ability, gender expression, and the injustice multiplies. Consider who told you that people can and should lose weight. Consider who taught you that people can and should lose weight. Check out the $60 billion+ industry that thrives on this and then research alternative approaches such at Health at Every Size® and Body Trust®. Look deeply into this. You will unearth more freedom for yourself perhaps. But do this for equity, truth and justice. Do this for your clients who expect you to collude with the problem of their body. Do this in the name of wellbeing and liberation. Hilary Kinavey, LPC is the cofounder of Be Nourished, a revolutionary business that helps people heal body dissatisfaction and reclaim body trust. The Be Nourished Training Institute offers training for helping professionals who want to move towards weight-safe and inclusive care. You may also find them on Facebook. When I heard the upcoming issue of the ORCA newsletter was going to focus on intersectionality, I was both excited and frightened. I was excited because I knew I wanted to write about this topic; I was frightened because I’d never done so before and to embark on such a task—publicly—meant I would likely feel vulnerable in this new experience. But, as a therapist, I often encourage my clients to lean toward new experiences with courage and wholeheartedness, and since I try whenever possible to embody these attributes, I decided to volunteer to write about growing up a biracial woman. For clarity, let me explain that my mother is a white American and my father is a Lebanese-born Palestinian who emigrated to this country as a young man in the 1970s and later became a naturalized US citizen. Prior to writing this article, most of what I’d come to understand about my experiences in the world relating to race and gender I’d seen as separate issues. I’ve thought quite a lot about how I’ve been challenged in the world as a woman, and I’ve thought quite a lot about my challenges as a mixed-race person. But, when I see the two together (which is the brilliant value of intersectionality), it shifts the frame of my experiences in a way that highlights the lived experience of these factors in concert. By the way, if you would like more clarity on what the term intersectionality means, Kimberlé Crenshaw, who created the term, offers an inspiring TED Talk (click here to view; trigger warning). I’ll illustrate how I experience intersectionality by telling you about some of my experiences. When I was in junior high, the first Gulf War was happening. We had televisions in the classrooms, and the name Saddam Hussein was frequently mentioned. Because I have had the immense privilege of being born with white skin, most people would only become aware I was mixed race when they would either inquire about my last name or when they would meet my father (or sometimes at the end of summer, after I’d gotten a lot of sun exposure). Prior to the first Gulf War, my name was difficult for most everyone in my small town to pronounce correctly, but suddenly, it became a target in a new way. A few of my classmates began to chide me with questions like, “Hey, is Saddam Hussein your uncle?” At other times, a specific racial epithet for Middle Eastern folks was uttered to me—in the guise of a joke, of course. Sometimes, the racism was not at all disguised with humor. Like the time my family was picketing in front of a movie theater to protest the stereotyped depictions of Arabs in a movie that was showing, and a man in a truck drove by and yelled, “Go back to Saudi Arabia!” (My family is not from Saudi Arabia, by the way, but that’s beside the point.) Or the many prank calls we received over the years, ranging from “jokes” to outright threats. And I won’t even go into the hours upon hours my family and I have wasted being detained in airports. Over time and with a lot of effort, I have been able to break out of the freeze response at times. But always, I can feel the familiar urge to get small and silent. Perhaps I can attribute my freeze response, at least in part, to nature or temperament. But when seen through the lens of intersectionality, it becomes pretty clear to me that if I had been male, I would have been much more likely to speak up or fight back, as we know that by and large the fight response is often covertly and overtly encouraged in boys and men. As women, we often learn to keep ourselves safe by being quiet, invisible, non-threatening. life may have played out quite differently. But as a biracial woman, I have glided through the educational system—and many social systems—with ease. But the burden had to get absorbed somewhere, and there has been a fallout. But it has been invisible, internal, somatic. It occurs to me that by writing about this intersecting experience of race and gender, I have made it visible. And it also occurs to me that writing is a form of fight and protest that I believe is healing. I was telling a friend about my process of writing this article and that it ended up being well over twice the target word count. “You must have had a lot to say,” she noted. Indeed. Often, I will encourage my clients to write when they are angry or sad, or both. I am grateful to have had the opportunity to practice that suggestion here, in my own life, with all of you. Thank you for participating in it with me. Raina Hassan, LPC, is the past president of the Oregon Counseling Association. She works in private practice in Portland. ORCA leadership has been hard at work preparing for our annual conference, which is quickly approaching! This year’s conference theme is The Constant of Change: Ethical Counseling Embracing Diversity. We are delighted to welcome Summer Brown, LMFT, and Dr. David Kaplan as this year’s keynote speakers. Ms. Brown is a leader in providing LGBTQI+ mental health treatment, while Dr. Kaplan is the American Counseling Association’s Chief Professional Officer and an expert on ACA’s code of ethics for counseling professionals. We’re very excited to have the opportunity to share their wealth of knowledge with you. 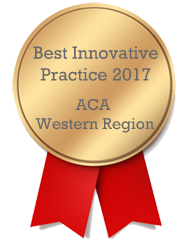 As this is my first newsletter address as ORCA President, I want to take the opportunity to thank you all for electing me to lead this major rebranding effort that led to ORCA receiving the 2017 Best Innovative Practice Award from the ACA Western Region. I am thankful for Raina’s leadership and the mentorship she has provided to me in assuming the role of ORCA President. In addition to the Innovative Practice award, this summer we received ACA's 5 Star Branch Award. Gianna Russo-Mitma accepted the award for ORCA while attending the ACA Institute for Leadership Training in Washington D.C. While in D.C., Gianna spent a day on Capitol Hill meeting with congressional leaders, advocating for issues important to the counseling profession, including legislation that would authorize counselors to be reimbursed through Medicare. in planning such a fun event. Thank you Networking Committee for all that you in planning such a fun event. Thank you Networking Committee for all that you do to help connect our counseling community! This edition of The Counselor focuses on issues related to intersectionality in the counseling profession. This topic is deeply important to our work, as cultivating awareness of our own identities and values is an ongoing process all counselors can and should engage in to be more responsive to the identities and values of the clients we serve. I am passionate about addressing treatment disparities in mental health services. One of my primary goals as President is for ORCA to provide leadership and, ultimately, positive change for this issue. It is my hope that the articles in this issue of The Counselor will help us all think more about the dynamic relationships we have with power and privilege, and the work we can do both internally and externally to better respond to the needs of our clients, ourselves, and our community. Intersectionality allows us to understand our various social identities, which are often associated with both privilege and oppression. Understanding this dynamic is crucial to informing our clinical and social justice work. We can start by acknowledging our own experience. As a boy, I experienced the privilege that comes from being a straight, cisgender male. Growing up in the 1970s as a son of Korean immigrants, however, I also experienced both overt prejudice and, more frequently, microaggressions. The classic began with “Where are you from?” and continued towards the inevitable insinuation that I couldn’t be “from here” or “American.” Sometimes, to get along, I would appear to shrug off slights aimed at immigrants who others perceived as “fresh off the boat.” I quietly demonstrated that my English was flawless – I was one of them. I remember feeling ashamed when clerks “struggled” to understand my mother’s non-native English. The pride I felt in passing as an all-American kid with my Little League games, “American” friends and other “non-Korean” interests would be intermittently shattered when someone else treated me as “other” or a “foreigner.” It was my privilege alongside my oppressions, arising from my intersecting identities that got me through those difficult times. multicultural upbringing and the number it had done on me... and I grew from shame towards self- acceptance. Simultaneously, I began to glimpse how removed my social identities were from the “enlightened liberal” stance I’d assimilated. There’s nothing wrong with my stances, except that my critical consciousness was not yet involved. My overlapping identities and my role as a counselor were not yet integrated. With an intersectional lens, I can integrate my multiple social identities, their associated privileges and oppressions, and how they ebb and flow over time and contexts. In college, I wrestled incompletely with the words of Juan Moreno who said “when it comes to oppression, we’re all perpetrators and we’re all victims,” but now I understand more deeply and can act more consciously. Society has changed, even as it remains stagnant. I no longer hide my love of kimchi - now I get to relish Korean food’s momentary hipness! Victor Chang, Ph.D, LPC is an assistant professor of psychology and clinical mental health counseling at Southern Oregon University. His clinical and research interests include: the therapeutic alliance (common factors), integrative approaches to psychotherapy, and trauma treatment. He can be reached at: changv@sou.edu. Gianna Russo-Mitma is ORCA's next President Elect! The special election period has ended, and the results are in. Gianna Russo-Mitma will be ORCA's next President Elect! Thank you all for voting and we wish the best to Gianna in her new role. She's been an amazing member of ORCA's board for the past few years and so I'd like to think of it as not losing a Communications Chair, but gaining a President Elect. The swearing in will happen on our July 22nd board meeting. ORCA 2017 Election Results are in! We are pleased to announce the winners of the 2017 Oregon Counseling Association (ORCA) Elections! Chad Ernest in an LPC in Oregon and owner and main counselor for Sunny Sky Counseling, LLC. He is a member of Counselors for Social Justice (CSJ) and the American Counselors Association (ACA). Before this position, Chad was on the board of Oregon Counseling Association (ORCA) as the Policy and Advocacy Chair and President of the Coalition of Oregon Professional Associations for Counseling and Therapy (COPACT). He holds a B.S. in Psychology and Philosophy from the University of Wisconsin-Madison, received in 2000, an M.S. in Mental Health Counseling, and a Graduate Certificate in Marriage and Family Therapy from Capella University received in March 2011. Chad believes in a client/family centered approach with collaboration in treatment between the counselor and client/family. His goal of counseling overall is wellness and/or reconciliation with one’s self, family and the community, and he believes in incorporating various theories into his practice to suit the needs of clients. Personally, Chad would like to add: I am married to a wonderful woman who is my main support in all my ventures. We have a ten-year-old son and have fostered other children. I have two dogs (Sunny and Sky) (ah! the name of my practice), two cats (Madison and Sherlock). I love to snowboard, read, write, camp, hike play video games, go for walks, watch anime, spend time with family and friends, and ride my motorcycle. Mitch Elovitz has been an LPC in Oregon since 2004. He has been an outpatient therapist since 2001, post Masters degree, and he has a specialty in DBT and CBT. Mitch also has experience in administrative work and supervisory work. Mitch has served on two other boards as secretary and soon as president. Personally from Mitch: I really enjoy being involved in organizations and working with people on projects. I enjoy spending time with my family, traveling, watching baseball, walking my dogs, running, camping, eating, reading, getting massage, socializing, and just being involved and an active participant in life! Please welcome them to their new positions and we look forward to having them serve! Dear Counseling Community, we drafted this letter to offer you our support and solidarity in our new political climate, no matter your viewpoint. We respect, value, and support all clients and practitioners in Oregon.